Is that a monster coming over the hill? NO it’s GRANAREUNITED 22 looming up in August!!! Once again the four horsemen of the poxy lips will be riding into the Lion to blast classic rock in true Granary style - the club may be gone but the spirit lives on. Starting a 7.30pm with a trip into the tripping past with DJ Super-Ed, on to Ade the First firing on both barrels (of real ale) with his pick of the classics, Al Read will do his best (if he can remember who he is and where he is) to bring back all those memories of the Friday night rock discos, then there’s the true rocker Adrian Coleman (the man who held the Granary together in it’s final years). Be prepared for a mega-bash of classic rock when all four join together to present the feast of floor fillers! 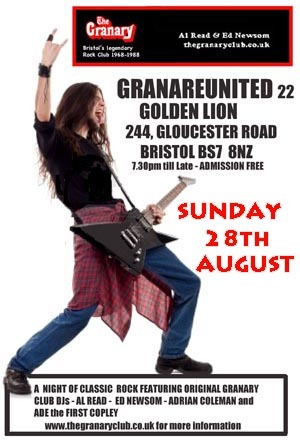 See the show cards and posters of Granary memorabilia and see if you can catch a free air guitar!